What happened to the rating system? so i expected to see some soul crushing ratings and some comments. Then i noticed that only one person actually commented on my game (the other one was a friend of mine). At first i was confused but then i realised it: The rating system disapeared! I have no idea why it is gone but i know that i want it back. It made LD special to me because i could see how good my game idea was and where i could improve. But now it is gone and nobody plays other games because there is nothing to do. It has no meaning. My question is: Why did it get removed? Also: Could we get it back please? Hi there! My name is DDRKirby(ISQ) — I’ve been participating in Ludum Dare enthusiastically for the past 5 years, having submitted 12 games to both the compo and jam events. 6 of these entries have placed in the top 10 overall (not just trying to boast — this will be relevant in a later part of this post). As many of you know already, there has been a bit of a situation regarding the upcoming August LD event. A poll was made, with the end result being the planning of an August LD event on the current LD website without using LD’s categorical 5-star rating system. As you might expect, this also triggered some community backlash. I am not affiliated with Ludum Dare officially and am in no position to make demands on how the August LD event should or should not be run. However, I wanted to provide a personal viewpoint on some of these issues. To highlight some of the major disadvantages and problems with LD’s rating system. To offer some suggestions for how we can best help the no-ratings August LD event to succeed. One of the things I really like about Ludum Dare is the fact that there are no monetary prizes. As the rules page puts it, “Your prize is your product.” (and to a lesser extent, the feedback that you receive on your game as well) This is supposed to help foster a low pressure, non-competitive environment where people can simply focus on making cool games, which is great! However, one thing I’d like to make clear is that winning Ludum Dare is a Big Deal. Being highlighted as one of the winners, especially in the Overall category, guarantees you and your game a TON of exposure, not only to fellow Ludum Dare entrants, but also by gaming portals, indie game sites, YouTube videos, twitch streams, and more. When Ripple Runner won 2nd place overall in LD29, I got a huge spike in followers and network traffic. Not only did several gaming news sites feature it in articles, but web portals started outright STEALING my swf file and hosting it themselves to profit via ad revenue. * A Korean stream video of my game later went viral, hitting over 80,000 views. I sell my game soundtracks on my bandcamp site. Despite having a minimum price of $0, sales from the Ripple Runner soundtrack earned me $200 in profit after LD results were announced because of the wide attention garnered from my 2nd place ranking and would go on to earn me over $350 in total in the following months. In other words, placing 2nd in Ludum Dare had MONETARY implications for me, almost as if I had received a $200 cash prize — and this is for a pay-what-you-want album! I can only imagine that things would have been even bigger if I had come in 1st place, or if I had charged $5 minimum per album sale. I would love it if Ludum Dare were not about winning and losing, but the fact is that the benefits gained from placing highly are very real and from this point on I have always felt mental pressures in the back of my mind to do my best to score highly as a result. This unfortunately provides a large incentive for cheating the system. A user that created multiple accounts just to give their game 5 star ratings. Games that have more votes than downloads (i.e. people rated them without even playing). Users that voted for many entries in an extremely short period of time (again, indicating fake “throwaway” votes that were made without playing the actual game). These things are not unique to Ludum Dare. This post from GameJolt outlines some additional ways in which people have tried to cheat around the rating system in their own game jam. Remember, these are community game jams without monetary prizes. An individual who hacked into/used multiple Facebook accounts to sign up and make it appear as though different people were rating their game. People giving their own entries many “4-star” ratings to avoid arousing suspicion from giving themselves 5-star ratings. Around 60 entries were found to have cheated by either starting early, or by using disallowed 3rd-party assets. Enlist one or more artists to draw artwork and animation for the entire game, but still submit it to the compo event. Use tilesets, background animations, and menu systems made completely ahead of time. Subvert the time limit — when submission hour ends, submit a broken link to the game, but keep working for another 48 hours. When I’m done, upload an incredibly polished game and claim to “fix the broken link”. Create many user accounts using different IP addresses. Submit random scrappy game projects under those accounts to avoid being flagged as fake accounts. Using these accounts I could upvote myself, then be on the lookout to downvote other people’s games that seem popular. Other randomized votes could be applied to avoid easy detection. Some of these methods would be very difficult, if not impossible, to track using the current LD rating system. Of course, any of them would constitute blatant cheating and disregard for the rules and as such I would never do any of them. But the point I’m trying to make is that there is both incentive and capability for cheating here. In addition, you wouldn’t even have to do very much of it: For Ludum Dare 28, our Jam entry missed hitting 1st place by a mere 0.02 points (4.39 vs 4.41). As few as THREE fake 5-star ratings would have changed the outcome. There are a multitude of ways in which the system could possibly be augmented and improved in order to prevent, mitigate, or detect the effects of cheating. Again, the gamejolt jam post illustrates one example of what this looks like (note that it involves coordinated efforts as well as manual intervention). However, it is IMHO unrealistic to expect any of these changes to be implemented for the upcoming August LD. ** How this should be dealt with in the future is outside the scope of this post. I merely wanted to illustrate the potential problems that exist in the current system. Numerical ratings encourage direct competition with and comparison to other games. Instead of supporting each other, we can become frustrated when “bad” games score higher than ours and are incentivized to rate other games more harshly. Some users have complained that taking a straight average of scores means that games with less ratings tend to have better chances at scoring particularly highly due to how variance works. “Celebrity” competitors sometimes*** being able to leverage their past success and popularity to earn higher scores (probably without even meaning to). “Gimmick” entries being voted consistently higher in certain aspects (e.g. rhythm games or audio-centric games regularly voted #1 for Audio). Wide voter preferences for certain stylistic choices (e.g. pixel art, chiptunes). Ratings that just don’t make sense or indicate that users to not understand how to rate games properly (e.g. Games with NO MUSIC OR SOUND receiving audio ratings between 1.5-2 stars). Ratings that are based off of the post-compo version of a game, not the 48 or 72 hour compo version (you can tell by reading their feedback comments). Cheating too easy (as described above in the previous section). I am NOT trying to say that these factors are pervasive and that our rating system is inherently terrible. These are just some potential disadvantages that I think people should be aware of and paying attention to. Personally, I believe that the pros of a rating system can well outweigh the cons if handled properly. However, I’m also interested and hopeful to see what a Ludum Dare without ratings will be like, if only as a test. If it fails horrifically, we’ll know to never do it again in the future, but I’m hoping that we can prevent that and instead make this August LD a success by focusing on qualitative feedback and community interaction instead numerical ratings. One of the main benefits of the categorical rating system is that it can provide you with a detailed breakdown of what areas you did well in and what areas you need to improve on. This is extremely useful, but could we do the same thing by using comments? Cool game, and nice job on your first LD! I especially liked the animation of the main character. Next time try to add some sounds! Innovation: This was not too much different from a standard platformer here, but I didn’t really mind. Fun: The game was pretty fun at the beginning, but got a bit repetitive, especially the water level which I think involved too many difficult jumps. Maybe adding another powerup would keep the game interesting all the way through? Theme: The main character was a goat! This definitely fits. Graphics: I really liked the animation of the main character. The background for the fire level was a bit too distracting, though. Audio: The music was a bit repetitive, but catchy. You should try to make some sound effects next time, with a tool like sfxr, bfxr, or Labchirp — it only takes a few minutes and goes a long way towards making your game feel more complete! Mood: I really liked how each level had a different theme. I think it worked very well to establish a mood. As I mentioned, sound effects would really help out here! Overall: This was honestly one of the better games that I’ve played so far this LD. It was a little buggy and could definitely still use some work, but I would love to see you work on a post-compo version. Feel free to leave me a comment on my game’s page if you do! Congratulations on finishing your first Ludum Dare! I’d really appreciate it if you could take the time to leave some feedback on my game in return. You can find it at […]. IMHO, this type of detailed feedback is infinitely more valuable than a simple numeric rating. I would highly encourage others to provide comment feedback in a similar style. You’ll notice that at the end of my example comment I requested the game’s author to provide me with feedback in return. This sort of “I’ll rate yours if you rate mine” trade has been a great way to get additional feedback in past LD events, independent of the “coolness” system. For this Ludum Dare I will be making it a point to return the favor by playing and giving feedback to anyone who leaves feedback for my game. It would be great if others could do the same. In addition, we should continue to leverage the compo site itself to help out jammers in need of additional comments. Don’t have enough feedback? Post some interesting screenshots of your game and ask for comments. Not sure what games you should play? Make a post inviting people to comment with links to their games. Let’s all help each other out! Another benefit of the rating system is the ability to select the cream of the crop based on the ratings accumulated through the voting period. The best of the best should absolutely be selected and called out so that we can all see what truly amazing games can come out of a single weekend. For the August LD, we won’t have any sorted ranking lists from which to select these entries from. Therefore, the onus falls on us, the jammers, to informally curate the top entries. Some LD jammers have already been doing this in the past by posting lists of their favorite entries, or even creating video compilations or twitch streams of notable entries. This is great, and I would encourage more jammers to start making these sorts of posts, and/or upvoting other posts if you particularly liked a game or two. I have personally never made a “My personal favorites of LDxx” post on this site before, but I plan to for LD36. This is your chance to shine the spotlight on whoever you think deserves it most. I know that this August LD has been on shaky footing and I understand that unfortunately, not everyone will be entirely happy with its outcome. I really hope that the community can come together and give it their all despite that. If we put in a little extra effort, we can definitely ensure that Ludum Dare 36 will be a great success. There are a myriad of ideas and suggestions that have been proposed to change or improve LD’s systems, or different methods in which the upcoming August LD should be run. Some of these ideas are really interesting, but I don’t think this is the time or place to discuss most of them as compo is already happening next month and it will be difficult to enact any meaningful changes at this point due to extenuating circumstances. I’m personally happy with any decision regarding this, but chose to focus on the reasoning behind the current state of things as well as the ways in which we can make the most of it. That said, I would like to specifically address the idea of preserving the categorial 5-star rating and scoring system, but not displaying an actual sorted “top 100” ranking of entries. This idea seemed great to me at first until I realized that anyone could probably just scrape the LD database and generate the top 100 list themselves. We already have people who are well-versed in scraping LD stats for this type of information — I don’t think obscuring the sorting order is necessarily the best way of solving this issue. If we were interested in achieving something similar, I’d be curious to see what LD might be like if your game’s rating was sent to you =privately= (as in, not displayed publicly anywhere), as that avoids some of the issues involved with cheating and competition while still providing a numeric score for your own personal use. But again, that’s not something that I can say is possible or even advisable. *I’ve since added rudimentary copy protection to my games to avoid similar incidents. **If I am proven wrong by a community effort, that’s great! However, such efforts are not something I am involved in nor are they the topic of this post. ***Yes, not always, I’m aware. ****Although I personally feel the opposite, since I have often left little or no written feedback on a game at all because I felt like my 5-star rating encapsulated my vote. Morph Space ratings are in! Overall very happy with the outcome. This is actually the highest rating for Graphics I’ve ever received, so it’s quite uplifting! Not done with the game yet, though. I’m currently working on polishing and adding to it, and while I can’t say how far it’ll go yet, I’m currently looking at the possibility of releasing an early post-compo polish update by this Friday. Big thanks to everyone who streamed and played my game – your feedback was immensely helpful! Additional thanks to everyone who dropped by or submitted their game for my Twitch streams; community like this is what makes these special, and you guys amaze me with each event. Keep being awesome! TD;LR? Just look at the pretty pictures. So, using the data that “Liam 😀” scraped from this Ludum Dare, I created some plots showing how each of the different categories correlate with the overall category. Here’s the lot of them (It’s a big image, so click to see it full size). Compo games are blue dots, and Jam games are red. There’s a quite few interesting things there, but here’s a few little points. 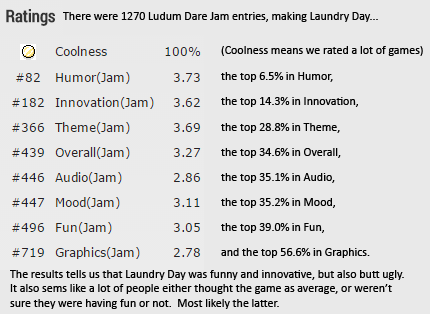 As we’ve seen from previous analyses (Google told me that’s the plural of analysis) of Ludum Dares, the fun category has the highest correlation with the overall category, and humour correlates the least. Another interesting thing is that the audio category is split for Jam and Compo games. You’re more likely to get a better overall score with the same audio score if you entered a Compo game, perhaps suggesting people are more forgiving for average audio in Compo games. The ID plot may seem meaningless, except that IDs are given sequentially, and so it roughly shows what score people got in relation to how long they’ve been around Ludum Dare. It’s slightly skewed in favour of veterans, but not much, showing that newbies have just as good of a chance of making a great game. But what I wanted to focus on is how the number of votes you got relates to the overall rating you get. Now, this plot is a little hard to read because there’s so many people clustered up in the left, which hides the significance a little bit. You can see a slight upward trend as you get more votes, but it’s that clear. If you compare it to the plot of Votes Given vs Overall, you can understand it a bit better. In the Votes Received vs Overall plot, we have games that got high ratings with a large number of votes. This would be pretty unlikely if they were unrelated, just because less games got that many votes, indicating that there is a correlation. But please remember CORRELATION IS NOT CAUSATION!!! It’s totally wrong to say that this means that if you want to do better you should try to get more ratings, because more ratings = higher overall. Instead, we have to say: Ok, there’s a relationship, what theories can we come up with that might explain it. When you think about it, it would make sense that games that are really good would tend to get more votes, because people share them more. Even though the general trend is upward, we can also see that there are games that get a lot of votes in a way that’s unrelated to how good the game is, such as people who are hugely popular or do a lot of publicity. Finally, an issue that often comes up is the concerns that games that didn’t get many votes could sneak a high score just by being lucky with the ratings they got. If you look at the plot, there aren’t that many games that didn’t do well that didn’t also get quite a few votes. There are a few, but as there are a lot of games that got a relatively small number of votes, there would also be a lot more if it was entirely up to chance. This doesn’t mean it’s perfect, just not all that bad. That’s all for now! Thanks again to Liam for the useful data! For LD31, I noticed that if we wanted to remove our game submission from a rating category, we had the option to disable it. I didn’t see the point, myself, but I suppose if your game really wasn’t trying for one of the categories, there’s no harm in recusing yourself. I would like to see another category added for future LD events: Controls. I think controls are a critical element to game design, since they are what makes a game interactive, and thus, a game. Not having its own category is an oversight that should have been corrected a long time ago. <3 this post if you would like to see a Controls rating category added to voting! So this was my third Ludum Dare, and I have to say I had a blast. Making Existential has been a load of fun. I learned a bunch and ate a lot of pizza in the process. I’m not going to summarize each day in this postmortem however, as I’ve already done that in both of my progress posts for the respective days. I’m happy with this overall. Originally I expected higher ratings, but in hindsight I understand why I got what I did (except for Audio – I’m getting way too high a score for that) – I had taken a project that was a little bit big for Ludum Dare and this resulted in me having to focus almost entirely on gameplay only. Almost no polish was able to be done, and as a result my ratings suffer. Besides that, I wasn’t able to make the theme have that large of an effect on the player, and so it was difficult to notice. Unity 4.6 UI system. I love it so much. Gameplay. Seeing as I focused mostly on this, I think I actually did it pretty decently. SharpDevelop. Magicolo suggested it as an alternative to MonoDevelop and it’s a huuuge improvement. Graphics. Since I focused on gameplay so much, I didn’t have much time to improve them. Audio. Same reason as above – no time. Project Scope. It wasn’t terrible, and I was able to do it, but as I’ve said it’s because of this I wasn’t able to polish the game. I’m planning on finishing up the game, hopefully by the end of the week. I plan for it to be my first ‘real’ project as a game developer, and am planning to release it for free on itch.io, GameJolt and Kongregate. I also plan to in the process improve the scripts I’ve made for making platformers. Anyways, that’s all. Have a good day, and see you next Ludum Dare (oh hey that rhymed). I was looking at the ratings for my game. Don’t get me wrong; I’m not disappointed with these numbers at all, considering how simple my game is. However, I’m surprised by a few of these numbers, especially Humor. Given I am 776th place in Humor, that makes my game “more humorous” than over half of the entries in Ludum Dare 28 (assuming over 2000+ entries). But my game has no humor in it at all; it was not an intended focus. So one of my questions is: how did my game rate so high in Humor when it didn’t have any? My other question is: would it be possible in the future for Ludum Dare to have certain categories, like Humor, be optional? Like for example, I want to be able to disable Humor for any game I make that doesn’t have any humor in it. Same with audio, etc. Here we are! LD27 has ended. It was a great first-time event for me, so congratulations everyone, and thanks for rating, commenting either below my game of below my post – and of course, thanks for entertaining me on twitter while working! However, I’m a bit disappointed with my final result. I know, I know, it’s fairly good for a first-timer, but I thought Hackfield was better. Okay, well…I have to admit that this is a kinda great result! Even though I expected at least 3.5, this is nice! I was almost sure that I’m gonna be the best in this category. I did what I could to do it the possible best, so that’s why I expected at least 3.5. It’s easy to understand. I mean, Hackfield in gameplay aspects is not more than a simple 2D “find-the exit” game, with some extra features. All those extras come to Mood. In fact, this is the highest point rating in the list. Obviously, since the theme was involved in the game – but nothing special. I mean, there might be quite a lot of games that changes only the playground after 10 secs. For what?! Why don’t you select “N/A” in cases where you can’t rate an aspect of a game?! Move on. Well, yeah. I didn’t work much on it. Also, tiles are confusing. So it’s kinda fair, even though graphics was literally downvoted. Siniter placement! Also, lowest score. What would you give for five 8bit-esque sound effect that were added in the final 30 minutes? Okay, and it was the actually heartbraking rate. Last placed aspect of Hackfield is fun?! Does it mean that for most people (out of 51 at least) found it boring, or at least not fun…the nightmare of the developer. But I deserved it partially, since some aspects of the game is truly hard. Especially security level 6 that even I couldn’t complete yet! I’m a bit disappointed, but making Hackfield was definitely a great experience (even when I was close to heart attack beacuse of the combination of immortal bugs and stress) and I can see why I deserved such ratings. Can’t wait for December, to create another game for LD#28! 26 queries executed in 0.136 seconds.